Omaha Police Lt. Jake Ritonya speaking to WOWT News on Friday, July 27. Omaha, NE - On Friday about 6:00 pm, Omaha police responded to a home in the 4700 block of Laurel Avenue after a report that a child was being attacked by a family pit bull. The 9-year old girl suffered severe facial injuries in the attack. As police carried the girl from the home, the pit bull continued to try to attack her. 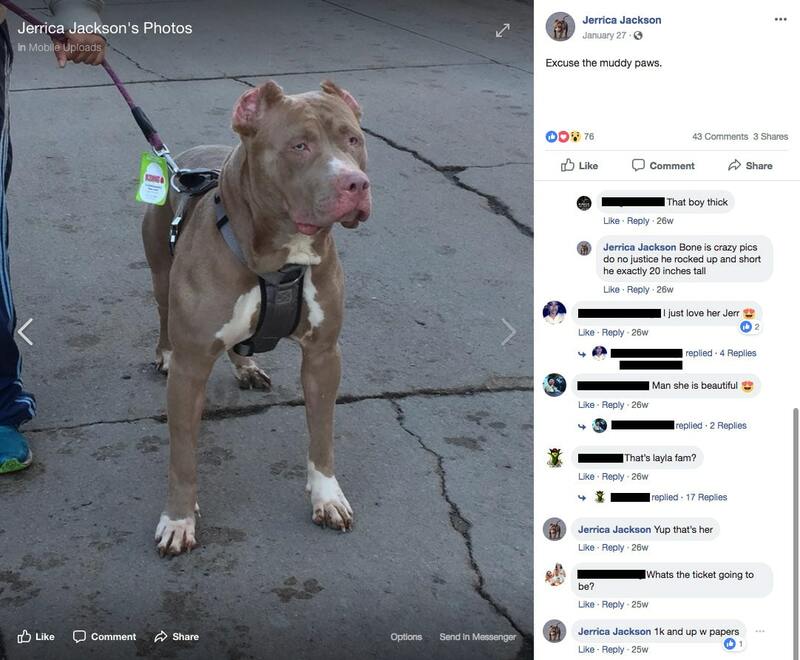 The fire department had a catch pole they used to detain the pit bull, a large 2-year old female named "Layla" that was reportedly in heat at the time of the attack. There were three pit bulls in the home -- a multi-pit bull household. Reports Friday stated the attack erupted when the child went to "pick up a knocked over trashcan." As the dog savaged the child's face, one of her siblings ran to a neighbor who called 911. The young girl was rushed to Nebraska Medical Center in critical condition. At least three children lived in the home. On Saturday, the Omaha World-Herald reported that the owner of the pit bull was arrested. "There were three pit bulls running around. It was kind of a crazy, chaotic scene," Lt. Jake Ritonya said. Initial reports also stated the victim suffered skull fractures. We located the pit bull owner late Friday, but were unable to confirm this until today. 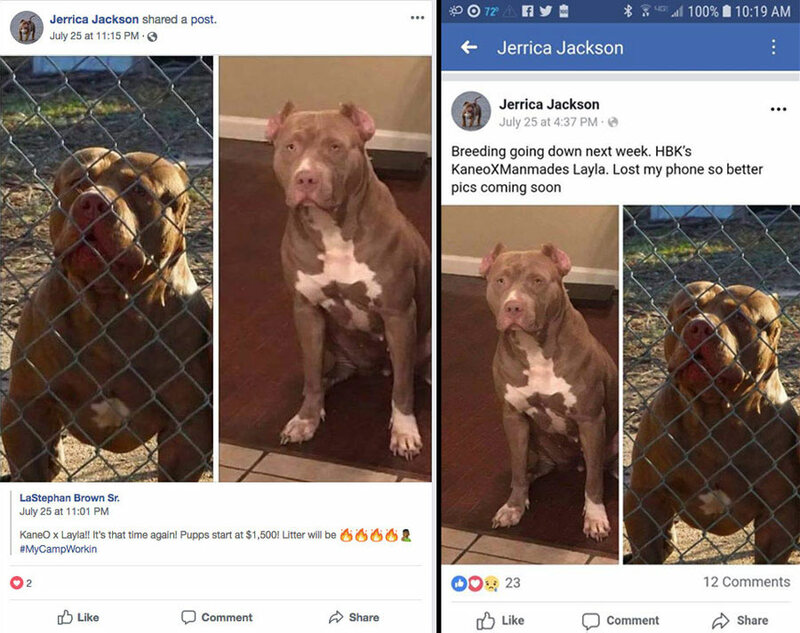 An updated report from the World-Herald (though still time stamped for the 28th) confirmed the dog's owner is Jerrica Jackson, 24, who is also a resident of the home. 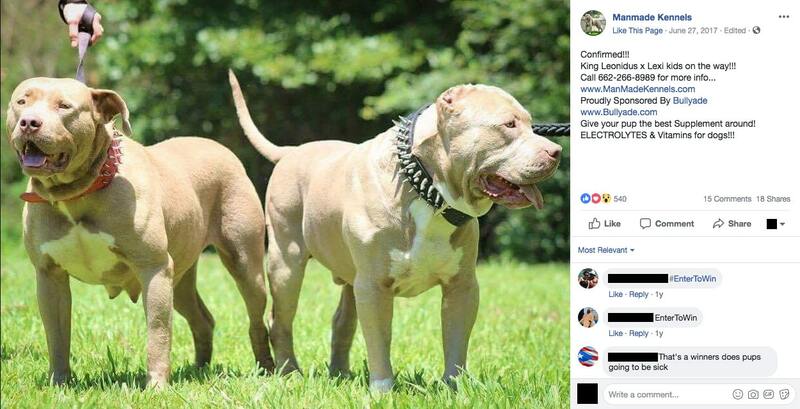 On July 25, Jackson posted a breeding advertisement of her pit bull. A police report identified the victim as Kahliyah Lloyd. Her condition has been upgraded from critical to serious condition. Kahliyah's mother is listed on the police report as Shamiah Campos, who also lives at the Laurel Avenue residence with her children. 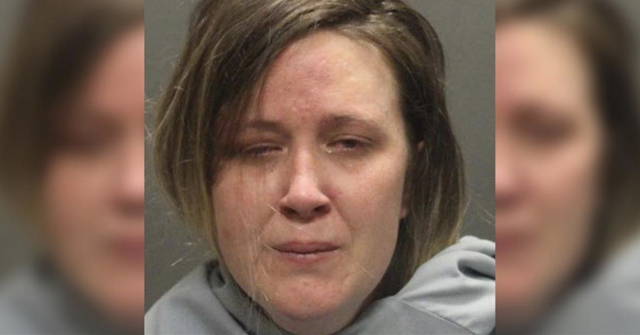 The arrest charges for Jerrica Jackson includes: suspicion of harboring a dangerous animal, failing to have an animal license and two counts of lack of vaccinations and failing to have dangerous animal liability insurance. In 2008, the City of Omaha passed a breed-specific ordinance that requires multiple fighting breeds to carry $100,00 in liability insurance. 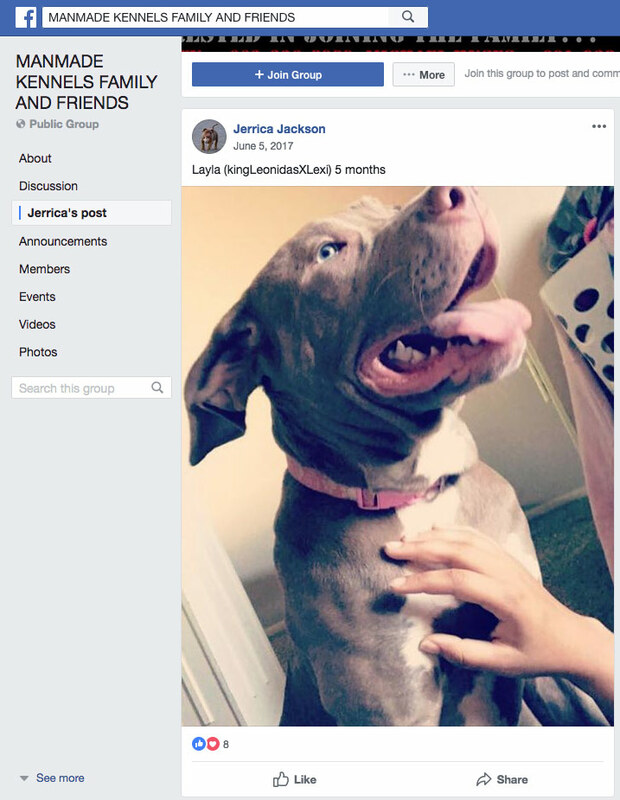 Just two days before the brutal attack, Jackson was advertising upcoming puppies starting at $1,500 with KaneO, an exaggerated, gargoyle Bully type owned by LaStephan Brown Sr. who likely also has failed to license, vaccinate and insure the multiple pit bull dogs in his home. We get so tired of beautiful young faces being destroyed by these dogs. 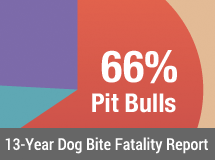 Especially when the pit bull "suddenly" unleashes explosive, unprovoked aggression at the age of two -- when the dog reaches sexual maturity and the most common time for these devastating attacks. This "tiring" is amplified by backyard pit bull "designer" breeders producing XL, XXL pit bulls for cash, all while these owners thumb their noses at local ordinances and unwanted pit bulls fill up city shelters. 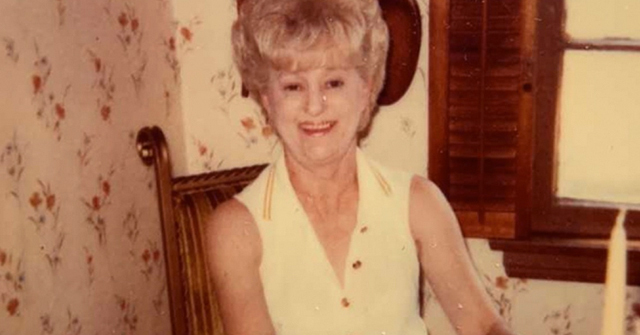 The World-Herald reports that Lt. Jake Ritonya, who was on scene Friday and at the emergency room, said that doctors and nurses appeared to be shaken by the extent of the girl's bite injuries, which were apparently confined to one side of her face and scalp. "The looks on their faces said it all," Ritonya said. The Nebraska Humane Society seized all three pit bulls in the Laurel Avenue home. 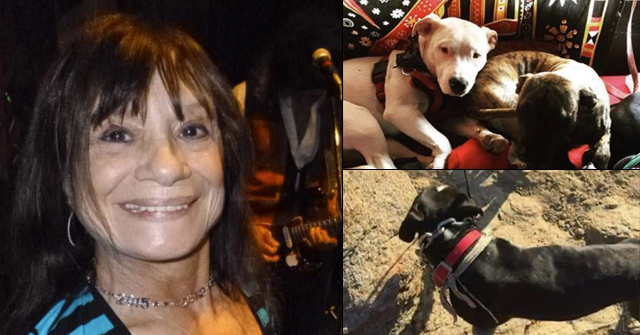 The attacker, and "planned breeding" pit bull Layla, is expected to be euthanized. 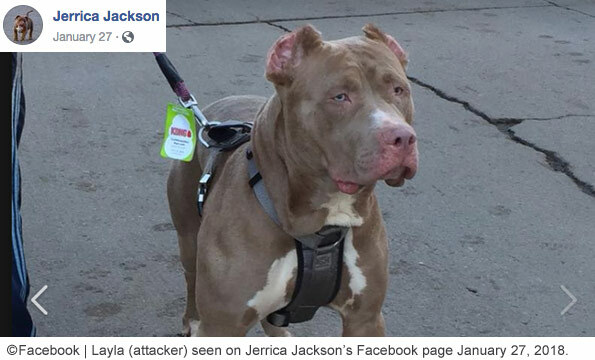 Jackson's mother, Jessica, said the attack was "totally out of character" for Layla, ignoring the reality of a 2-year old pit bull in heat. She said that Kahliyah "looks better than I expected" and is "going to have some scars." She added that, "we're looking forward to her getting healed and being the smart, beautiful girl she's always been." It's unknown what the fate is for the other two pit bulls. Possibly when Kahliyah is released from the hospital, they will greet her in her home. 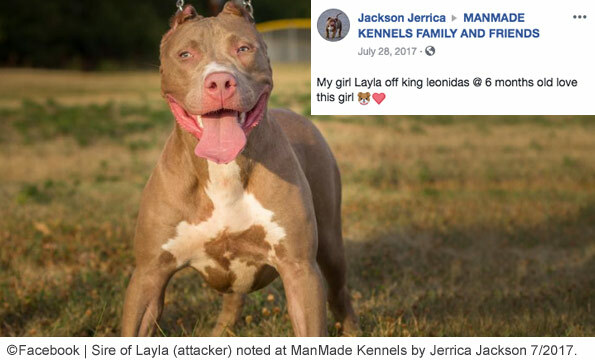 The pit bull "Layla" that savaged the little girl's face is the offspring of ManMade Kennel's King Leonidus and Lexi from a late 2016 litter. 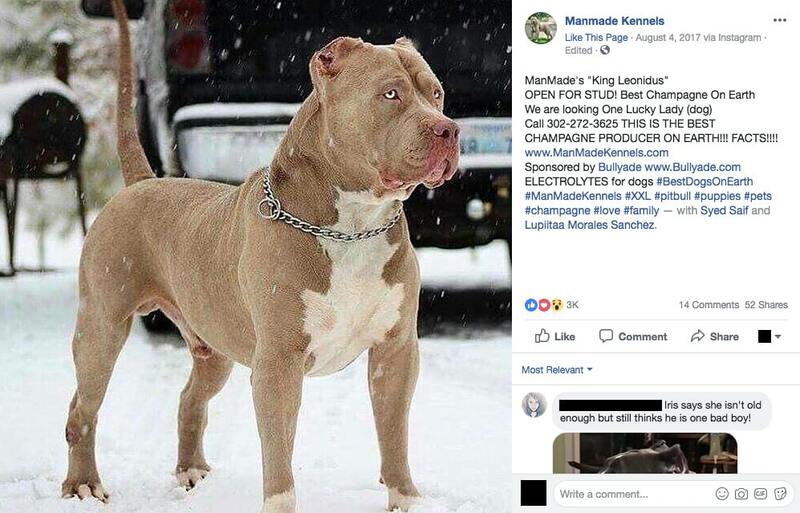 ManMade Kennels claims they create "Pit Bulls Made for Families" on their corporate website. They also claim: "Our dogs are temperament bred for families, we DO NOT breed HA (Human Aggressive) dogs AT ALL" (emphasis by ManMade). If that were true, they would no longer breed King Leonidus or Lexi, who produced a child mauler. 1Jackson misspells the sire's name multiple times as does BullyPedia. Reading the comments from the police officer in the comments from the victim’s mother is very confusing. I am pretty sure the victim’s mother is a pitbull apologized and is in complete denial. I am suspecting that the dogs owner is her girlfriend/partner this is significantly contributing to her statements. We know that Jerrica and the child’s mother are good friends. We don’t know when the friend and her 3 children moved into the Jackson home. 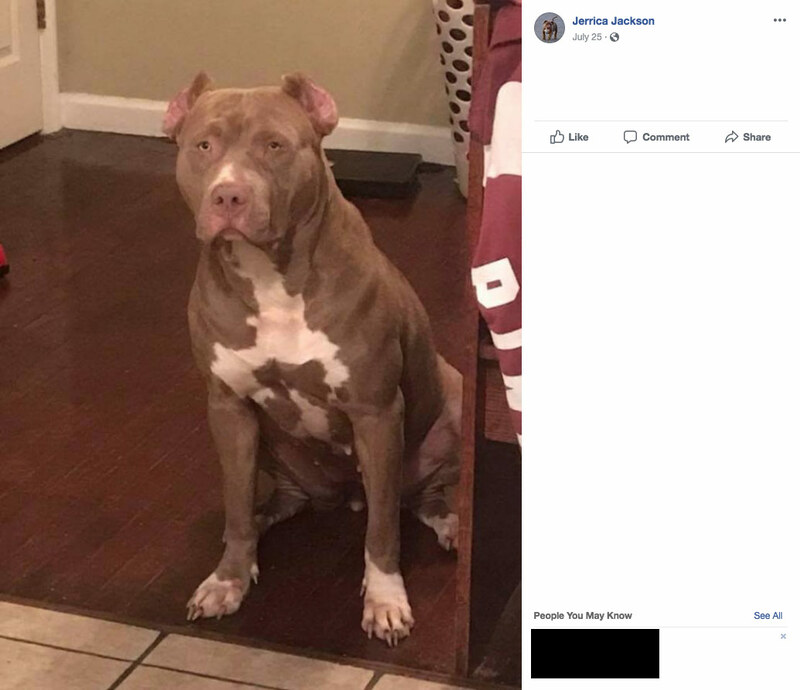 The child’s mother was also “getting into” the pit bull thing, according to her Facebook page. She may have in fact owned one of the pit bulls in the home too. 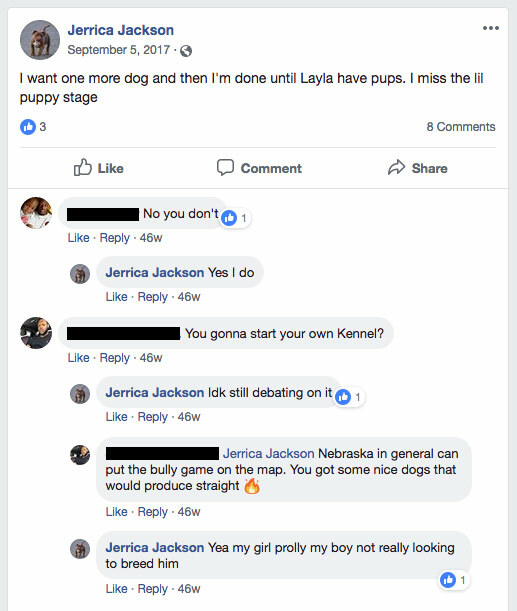 One of the home’s pits was named “Grizzly” which could have been owned by either of the women and came from the same breeder Jerrica was about to breed Layla with (or did breed with on 25th). What a bunch of absolute dirtbags! They should all be in jail for nearly getting this child killed, banned from owning ANY dogs for life and all the dogs should be dirtnapped. If you go through the Facebooks of Jackson’s ‘friends’, it’s obvious that she’s part of a breeding program to produce these huge, muscle bound gargoyle freaks. These terrible adults should not be around children or dogs. The dogs are obvious fed steroids from puppyhood. 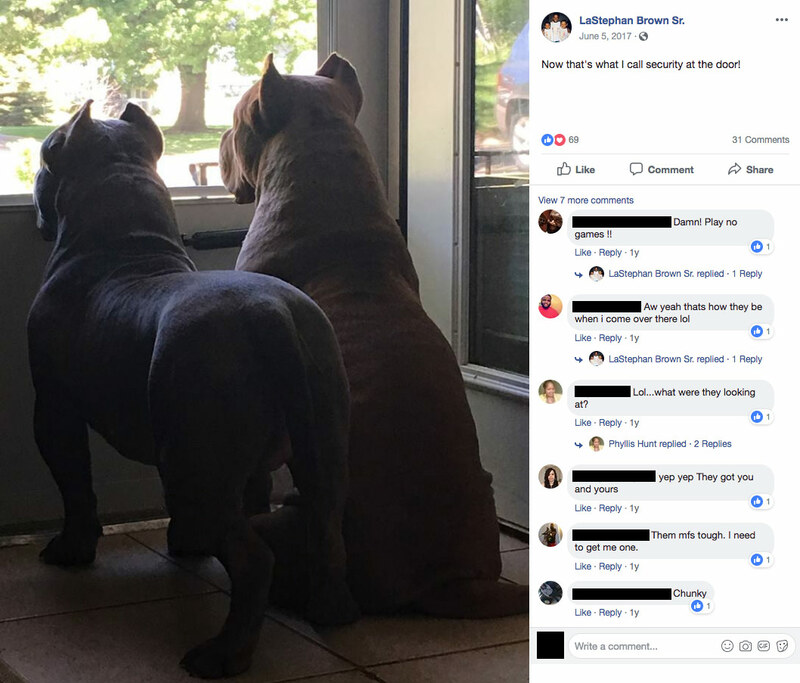 The $1,500 puppies are somehow ‘guaranteed’ to grow up to be huge, ripped gargoyles according to at least one of Jackson’s buddies. Bad enough the natural propensity of the Pit to be unpredictable and violence-loving, these blatant criminals are taking it to a whole other level. And scrolling through their public Facebooks, they aren’t trying to really hide it. Nauseating. Frightening. These beasts have all the civil rights of a member of the Manson family. People who butcher pits’ ears like that are likely dog fighters or dog fighter wannabees. Not that a non-fighting pit couldn’t have done this, just that active fighting lines are more likely to. Wow, Colleen Lynn, I didn’t know all that. 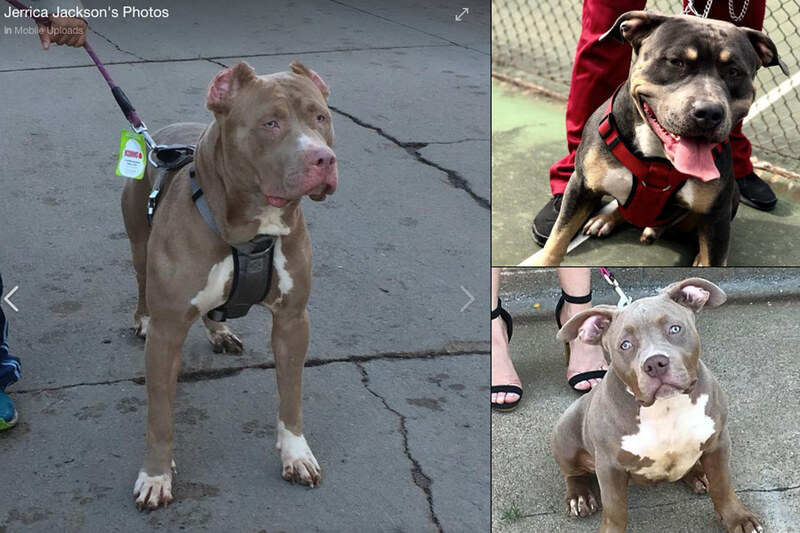 Very interesting–and scary, as my cousin recently adopted a 6-year-old female pit bull and said “they” (shelter staff?) told her it looked like the dog’s ears had been cut off with scissors. Cue the raving about how sweet this pit is, the pics of her sleeping in bed with the little kids and cuddled on her husband’s lap, and then even the sharing on Facebook of an article about pits being America’s dog. It’s like watching someone get indoctrinated into a cult. Street fighters or street fighter wannabes then. I suppose the ‘class’ of fighting matters? In the cropped ear scenario — yes. Then you get into the pit bull “designer” bullies, which is primarily about fashion & status. The dogs are not used for fighting at all. Sheer status symbols. We addressed this in a 2014 fatality. Be sure to check out the adjoining PDF about the breeding and marketing of this dog. This is terrible! I live in Papillion and I haven’t been able to use my backyard in over three years because of pit bulls behind us! I’ve reported it to the humane society so many times. They have 4 different kinds of little dogs plus the 2 very large pit bulls. At one point there were 9 dogs! Plus 6 little puppies. One day I looked out my window and saw two pits following the little toddler that lives there and I was so scared it would attack her. I couldn’t see where the adults were because of my bushes block some of my view. I don’t trim them because I’m afraid the dogs will come over my fence! I first reported them charging my fence and growling at us and the officer at the NHS said unless there in your yard we can’t do anything. They said that the people say the dogs are visiting..I’m like oh yeah 24/7 ok.
I’m scared to go out on my deck because they hear my door open and growl and run to the fence pacing back and forth. I can hear them barking from the basement and they let them out at night with bark collars on. All I think about are the two little children inside and pray they never get mauled to death. I can’t wrap my head around it! Why would anyone put their children’s life in danger! Plus the living conditions must be awful! Meme Kay, get a lawyer. And have him or her write a letter to the owner of this property — and copy the Humane Society in on it. Include the information that you’ve posted here. If, heaven forbid, anything happens, the property owner and the Humane Society will not be able to plead ignorance. If they had just gotten one of the willing adults I don’t think I would have any concern other the tax money wasted on their medical expenses. As is often the case sadly it is the children that suffer. It’s awful that police doesn’t shoot these monster dogs on the spot. 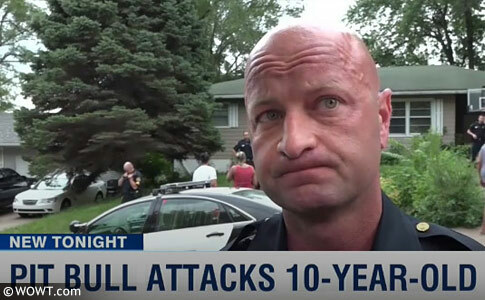 That dog had just attempted to kill a child, and was still trying to attack while police were carrying the girl out of the house, it was aggressive and could easily attack a police officer or a first responder. And now they are going to “most likely” euthanize that disgusting dog, with our tax dollars. Would have been much cheaper to shoot it right then and there. I agree, a .38 right between the eyes is what should happen to any dog attacking a child. That society has come to accept that dogs can maim and kill children, and that it’s acceptable, is very telling.